This recipe features the best of breakfast in one package, Bacon & Egg (in a) Muffin with a hint of maple syrup and a surprise inside. Ok, I’ll fess up right off the bat. 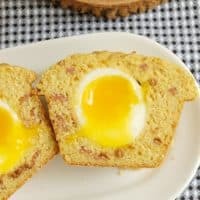 I didn’t come up with the idea for a muffin with a soft egg inside. I wish I did, but I’m totally stealing the idea from Craftsman and Wolves in San Francisco. A couple of months ago when a photo of the muffin popped up on my Facebook news feed I was immediately stricken with envy that I didn’t invent this genius muffin. The original dish has the egg encased in what they call a “meat cake”. I’m not really sure what that is, so I decided to make a muffin using some of my favorite ingredients; buttermilk, corn meal and maple syrup. These all also happen to be great breakfast ingredients. 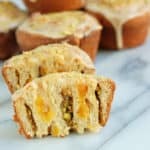 The muffins would have to be baked in a jumbo muffin pan to accommodate the egg. I thought the hard part of mastering this dish would be figuring out how to bake an egg inside a muffin so that the white cooked through and the yolk remained soft. For the first test-run of the recipe I used eggs prepared 3 different ways. I soft boiled two eggs, froze two eggs in the shell (yes, it’s possible), peeled the frozen eggs then put them into the muffin batter. I also cracked a raw egg right into the muffin batter. From that first batch I learned that soft boiled eggs were the way to go. The raw egg cooked through and had a hard yolk. The frozen eggs didn’t cook enough and had runny whites as well as a runny yolks (runny yolks=Yum, runny whites≠Yum). I didn’t realize that the real problem would be getting the right texture for the muffin. I started with a version of my Cast Iron Skillet Corn Bread. The muffins from the first test batch were very dense and rubbery. I realized I’d manipulated the batter too much and probably knocked all the air bubbles formed by the baking soda out of the batter before it went into the oven. Also, I wanted a little more sweetness and moisture. So it took three more test rounds to get the texture and flavor I wanted for the muffin. 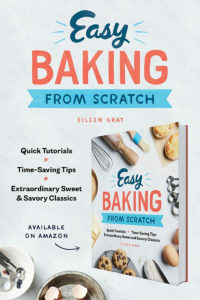 I adjusted the ratio of flour to corn meal to lighten the crumb, upped the amount of buttermilk for more moisture, made the batter a little sweeter, and used a mix of baking soda and baking powder to get more lift when the batter hit the oven. Be Eggzacting (sorry!) when boiling the eggs! A few notes on handling the eggs; Once the cold eggs go into the water (just an inch of water) cook them for exactly 5 minutes. I don’t often use a kitchen timer, but for these eggs I did. As soon as the timer goes off bring the pot to the sink and fill it with cold water to stop the cooking. Let them cool for 5 minutes then put them in a bowl in the refrigerator to cool completely. I did this step the night before. Put the unpeeled eggs in the freezer while you’re making the batter (for no more than 1/2 an hour, you don’t want to freeze them). This way the eggs are very cold when they go into the oven and I found them easier to peel. I got perfect eggs every time using this method. So here it is, all the best parts of breakfast in one muffin; bacon, maple syrup, corn bread and a runny egg yolk for dipping. Thanks to chef William Werner at Craftsman and Wolves for the inspiration. Preheat the oven to 350F convection or 375F regular. Whisk together the flour, corn meal, salt, baking soda, sugar and spice in a mixing bowl. Bake for 20 minutes just until the top of the muffin springs back when pressed. If you're not sure it's done pick a bit of the crust off the top to see if it's baked. 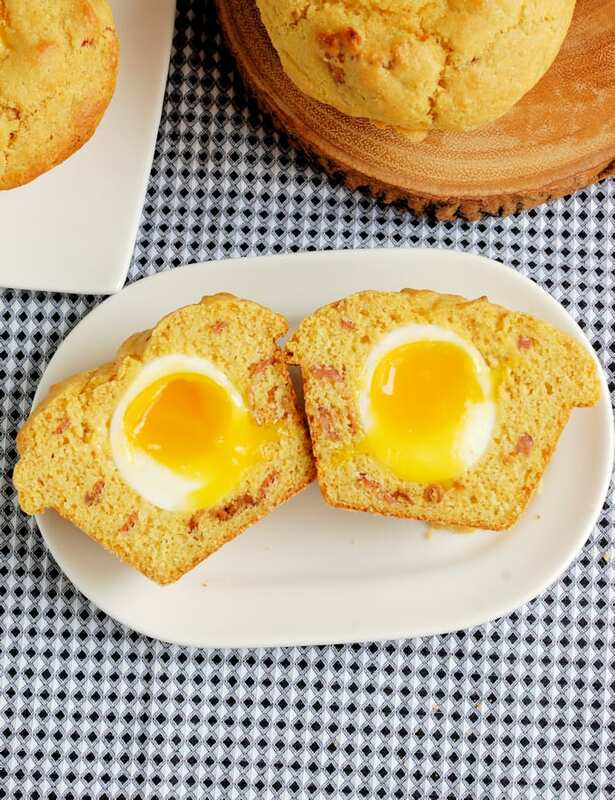 Don't poke a toothpick into the muffin or you might break the egg. Allow the muffins to cool for 5 minutes in the pan. If a "muffin top" sticks to the top of the pan use the tip of a small knife to loosen the top. Carefully tilt the pan to one side, grasp a muffin by the top and gently shimmy it out of the pan. 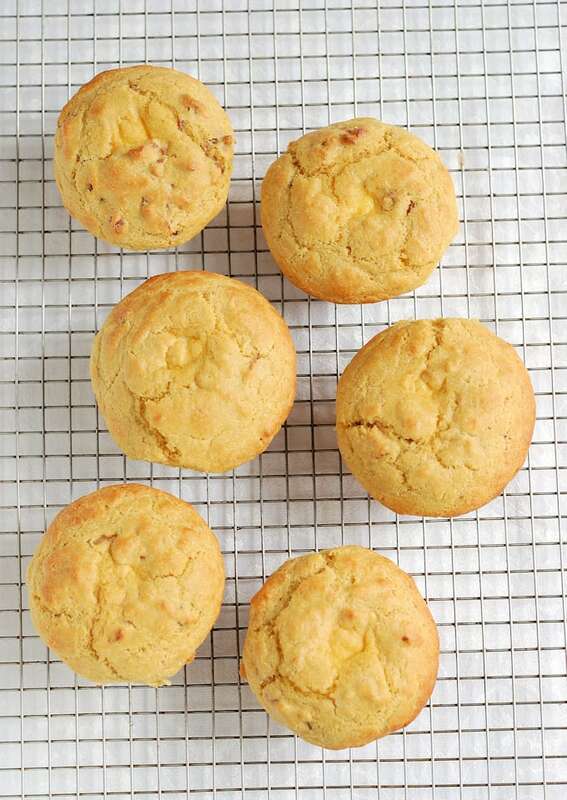 You may have a little extra batter, which can be baked as muffins without the egg inside. 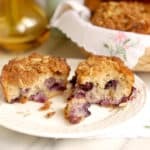 The muffins are best eaten while still warm from the oven. 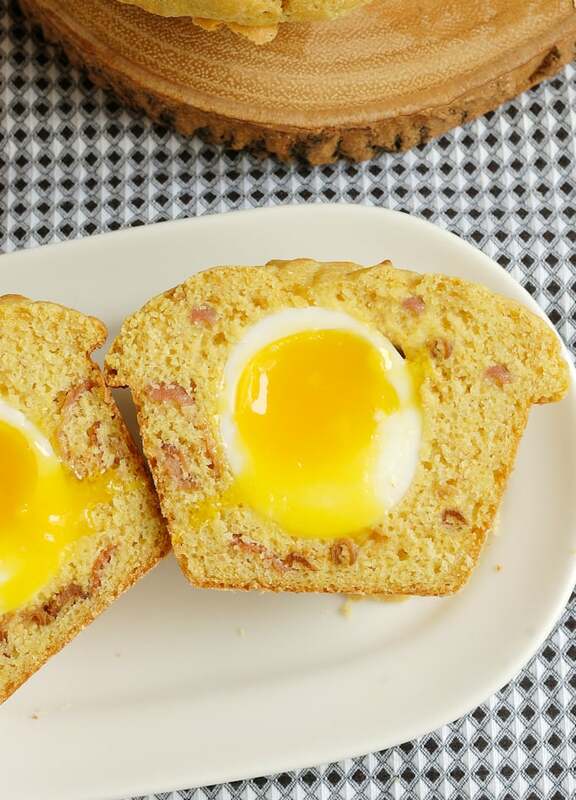 You don't want to use a knife or you might break the yolk inside the muffin. Leftover muffins can be wrapped in plastic and refrigerated for a day or so. 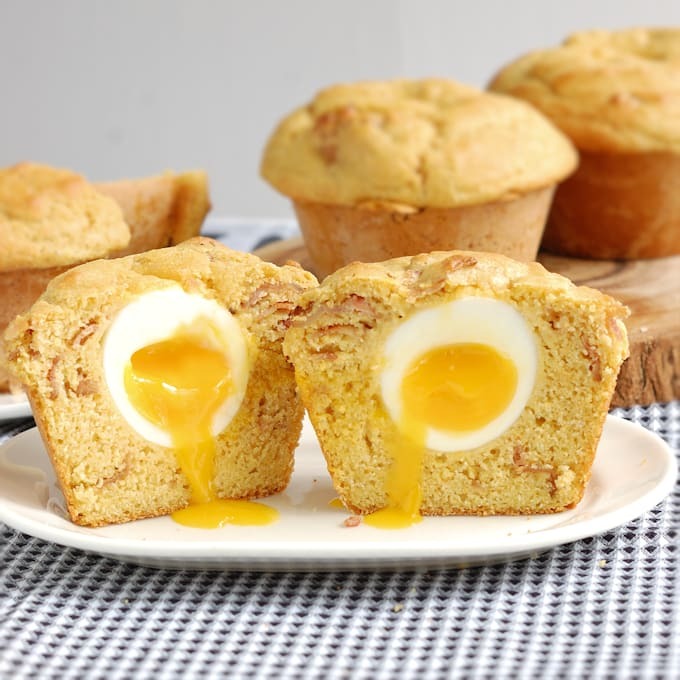 Wrap the muffin in foil and warm in the oven, being careful not to overheat and cook the yolk. What a wonderful idea! 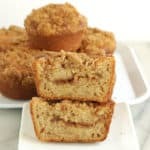 Love everything about these muffins! I have been wondering how they do this at Craftsman & Wolves for months! Thank you for sharing! Thanks, Dani! I totally stole the idea from them, but did work out the how-to through trial and error. I saw your video in Instagram and HAD to check out your recipe. WOWZA! This is brilliant. 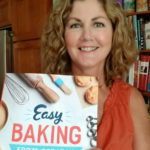 I don’t care whose idea it was, you worked on your own recipe to figure it out. Props! 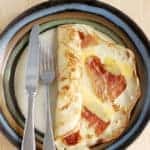 I absolutely love this recipe and would like to try it but my husband really doesn’t like maple syrup. Is there something that could substitute? Or just omit? I am wondering if they would be to dry to omit. Maybe some cheese? Thank you so much, can’t wait to try! Hi Michelle, you don’t taste the maple syrup so much in the final muffin. But you could certainly substitute honey instead of the maple syrup. You could also use a 1/2 cup of sugar instead of 1/4 cup sugar and 1/4 cup maple syrup. Hi Stephanie. They taste the best when they’re still warm from the oven. 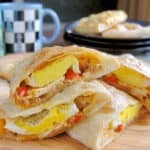 Left overs can be frozen, but the yolk won’t stay runny. Still tasty though. I made these so many times we had lots of them in the freezer. 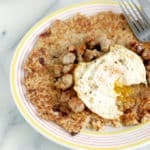 Wow – love this recipe! Such a cool and unique idea! !